Although Mexico ceded 55% of its territory to the United States in 1848, and the American Civil War in 1861 resulted in 620,000 deaths, the tremendous losses of both nations can be traced directly to the results of the Battle of the Alamo in 1836. In 1846–1848, unsettled disputes and claims would be settled once and for all on the battlefields of the Mexican-American War. Next, Washington would witness fierce debates in Congress while determining whether Texas would enter the Union as a free or slave state. Just 13 years after fighting concluded with Mexico, the Northern and Southern states would be entangled in bloody civil war. If Washington annexes Texas and goes to war with Mexico, it will be a most unrighteous war and these deeds will lead to civil war in the United States, stated Patriot John Quincy Adams during the Texas Revolution in 1836 as he strongly opposed both Texas annexation and war with Mexico. Twenty-five years later his concerns of civil war would unfold as North and South engaged in a contest of ideologies and wills. From Mexico's point of view, the Americans at the Alamo (February 26, 1836–March 6, 1836) were rebellious foreigners challenging Mexico's sovereignty. They were not valiant men or heroes of some magnificent last stand, but rather a patchwork rebel group trying to usurp the sovereignty of Mexico in an effort to annex, to steal a large swath of its territory. On the other hand, the United States justified its westward expansion during the 1800s as the policy of Manifest Destiny, and the resistance at the Alamo was the just cause of free men withstanding the tyrannical rule of Mexico City. Whereas the Battle of the Alamo was a military defeat for the Americans, it would become a psychological victory and rallying cry for the nation. As results of the Alamo would send shockwaves across the United States, relations with Mexico would remain strained over the next decade. Unsettled border disputes between the two nations would eventually lead to the Mexican-American War (1846–1848), with the defeated Southern neighbor surrendering more than half of its territory as the outcome. (Right) First photograph taken in Texas. 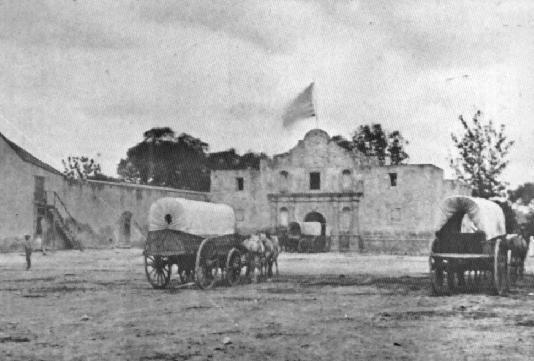 This historic picture in 1849 is one of the earliest known photos of the Alamo as well as one of the initial photographs taken in Texas. This photo was taken following the Mexican-American War and only thirteen years after the Battle of the Alamo. The annexation of Texas and war with Mexico would add new slave territory and contribute to civil war in the United States, said a very vocal opponent by the name of John Quincy Adams in 1836 and again in 1846. Adams had a lengthy public service record with tenures as president, senator, and congressman, and his father was none other than President John Adams, the successor to George Washington. Adams' opposition to slavery made him, along with Henry Clay, one of the leading opponents of Texas annexation and the Mexican–American War, but citizens of a nation who had long been opposed to war with Mexico, let alone an invasion with the objective of taking and annexing more than half of the Southern neighbor, were now beating drums of war and crying Remember the Alamo, as a sitting president and members of both houses alike would turn to the Alamo as the nation's rallying call. The pivotal siege and Battle of the Alamo, February 23–March 6, 1836, was a clarion sound to all Americans and it resulted in many men enlisting in the U.S. military and fighting during the remainder of the Texas War of Independence, or Texas Revolution as it was also known, which began on October 2, 1835, and concluded on April 21, 1836. It was during the siege of the Alamo that Texas delegates would assemble, declare independence, and form the Republic of Texas, March 2, 1836–February 19, 1846, and when Texas was admitted to the Union as the 28th State on December 29, 1845, it was on February 19, 1846, that transfer of power would be given to the Lone Star State. (Right) As men rushed to enlist in the U.S. military while beating the war drums to Remember the Alamo, both houses had enormous support for prosecuting the Mexican-American War, a conflict that would have otherwise been unpopular. Most Americans lived much closer to the Canadian border and were far removed from activities near the Rio Grande. In 1840, only three states, Arkansas, Louisiana, and Missouri, existed west of the Mississippi, and the nation's population was concentrated in the north and northeast. Abolitionists also viewed the annexation of Texas as merely another slave state, so what single event galvanized the nation to go to war with Mexico? The citizens of the United States had been constantly reminded by newspapers and politicians alike that some 200 patriotic Americans were butchered at the hands of blood thirsty Mexicans, so the war had become a rather simple act to sell by 1846. Casualty figures provided courtesy Department of Veterans Affairs. The battle cry that rose from the lopsided Mexican victory at the Alamo over the ill-equipped foreigners who challenged the sovereignty of the host nation, was subsequently shouted during the remaining battles of the Texas Revolution to the many battles that would be fought just 10 years later during the Mexican-American War. 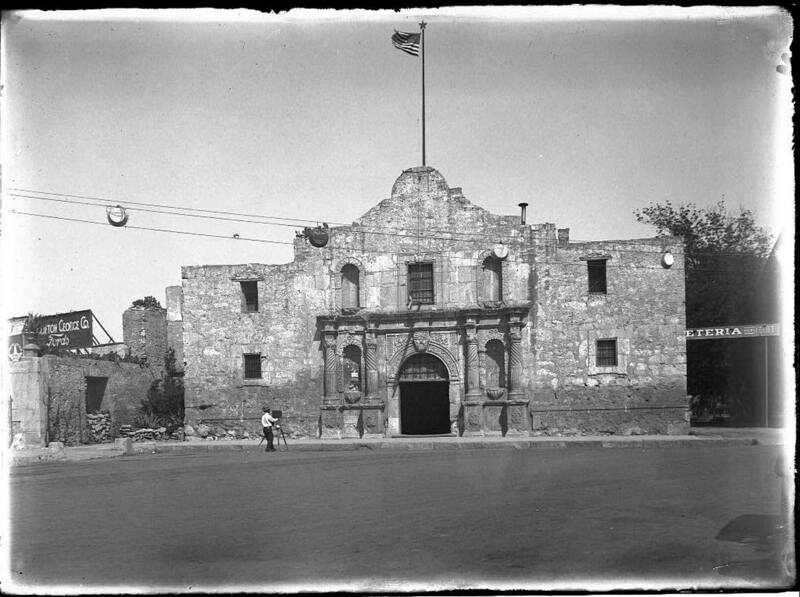 While "Remember the Alamo" is widely known by Americans, the name Alamo remains synonymous with a last stand rallying point for many who served, and continue to serve, in the U.S. armed forces. 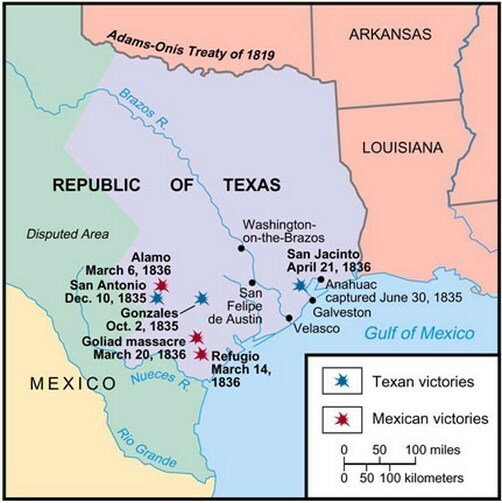 Following the Alamo tensions continued to escalate between Mexico and the United States during the next decade with heated disputes over the Republic of Texas as well as defining the common boundaries and borders. The Mexican-American War, which began in 1846, was fought over such disputes. After a crushing defeat in 1848, Mexico signed the Treaty of Guadalupe Hidalgo of 1848, also known as the Mexican Cession, which formally ended the conflict and sealed the American victory, and in return for $15 million and the assumption of Mexican debts to Americans, Mexico relinquished its claims and rights over immense territory that now forms the present-day states of California, Nevada, Utah, and parts of Arizona, New Mexico, Oklahoma, Colorado and Wyoming. Mexico also agreed to finally relinquish all of Texas, including the disputed area along the border, and recognize the boundaries according to the articles of the Treaty. The U.S. Congress ratified the Treaty on March 10, 1848, and Mexico subsequently ceded additional territory to the United States with the ratification of the Gadsden Purchase. The singular Battle of the Alamo resulted in a firestorm of events between the neighboring countries for the ensuing decade, only to conclude with the Mexican Cession of 1848, just 12 years after the Battle of the Alamo. Once the Mexican Cession was signed, 55% of the vast territory of Mexico was signed over to the United States, thus extending the borders of the U.S. from sea to shining sea. It also removed from its doorsteps the footprints of the global powers of England, France, and Spain henceforth. Until the Mexican Cession in 1848, the lands that now formed the United States had long been a struggle between many nations that had once staked their claims of ownership. As a result of the Battle of the Alamo and Texas Independence, Mexico would soon succumb to political discord, civil strife, and finally civil war. After the Mexican War, Mexico was burdened with staggering debt, the loss of 55% of its territory, and a collapsed economy. France would even make a grand effort to conquer what it referred to as a weakened Mexico in 1862, only to be repulsed at the Battle of Puebla on May 5, 1862, by a much smaller, yet determined Mexican force. To commemorate the Mexican victory, it is celebrated annually during Cinco de Mayo. The United States too would pay a hefty price because of its acquisition of Mexican territory. With the Mexican Cession in 1848, formally the Treaty of Guadalupe Hidalgo, the nation purchased territory that forms the present-day U.S. states of California, Nevada, Utah, most of Arizona, about half of New Mexico, about a quarter of Colorado, and a small section of Wyoming. Until 1850 the nation had hosted 15 free and 15 slave states, creating a balance between proslavery and free states. When California was admitted to the Union as a free state in 1850, the United States soon added three additional free states with Minnesota in 1858, Oregon in 1859, and Kansas in 1861. The nation was now confronted with an imbalance of power between slave and free states, known as sectionalism, which served only to fuel existing tensions between the North and South. The Mexican Cession of 1848 resulted in the Compromise of 1850 and the rapid shift in political power and influence. While the Compromise of 1850 fanned the flames of sectionalism, in just eleven years, 1861, the nation would be engaged in the bloody American Civil War. The Alamo, ca. 1910. Rare photo. Unlike several other battles during the Texas Revolution, most individuals are only familiar with the single engagement at the Alamo, which then, like now, stirs emotions of both Mexicans and Americans. The Alamo was an American defeat and a Mexican triumph, but politically, it did more for the United States and its appetite to extend the borders of the nation from sea to shining sea than any other event during the century. Without some 200 dead Americans covering the grounds of an unfamiliar mission in San Antonio, it would have been very difficult, if not impossible for the White House to have rallied the nation and its citizens to war against Mexico just ten years later in 1846. Among the most vocal opponents of the looming war with Mexican was Congressman John Quincy Adams of Massachusetts. Adams had voiced concerns about expanding into Mexican territory in 1836 and again in 1846 by opposing the Mexican–American War and annexation of Texas, stating that both would serve to add new slave territory to the nation and therefore stir the country to civil war. Congressman Adams, whose service to the nation would span more than 50 years and include a single term as President of the United States, had correctly predicted that both events would push the nation into civil war, an armed conflict that would eventually devour some 620,000 Americans. From unjust to immoral, were the words of who's who in America while challenging the grounds for war with Mexico. While debating whether the United States should go to war, Congressman Abraham Lincoln challenged President James K. Polk by referring to any war with Mexico as immoral, proslavery, and a threat to the nation's republican values. By enlarging the borders of the United States at the expense of any nation would also serve to provoke President Ulysses S. Grant, who had successfully led the Union Army to victory during the American Civil War, to level a stern rebuke at the nation while writing his memoirs in 1885. Having fought in the conflict as a lieutenant, U.S. Grant said in 1885 that the Mexican-American War was "one of the most unjust ever waged by a stronger against a weaker nation. It was an instance of a republic following the bad example of European monarchies, in not considering justice in their desire to acquire additional territory." Continuing in Grant's memoirs, he wrote, "I have never altogether forgiven myself for going into that [war]. I do not think there was ever a more wicked war than that waged by the United States on Mexico. I thought so at the time, when I was a youngster, only I had not moral courage enough to resign.” Ulysses S. Grant would rise through the ranks to the position of Union General of the Army before serving as Eighteenth President of the United States. Seeking any opportunity to severely punish Mexico for what many believed to be the slaughtering of America's finest during the failed coup attempt at the Alamo and for the continual border disagreements that followed the Texas Revolution, Washington would prod and provoke its neighbor until the two nations were engaged in the Mexican-American War. When you remove the results of the Battle of the Alamo, the majority of Americans, having resided much closer to Canada than the Rio Grande, had little interest in a conflict with Mexico. Without the carnage at the Alamo, the fight with Mexico had very little support and likely would have never been fought. But now with a conquered Mexico, the nation would indeed span from sea to shining sea. Recommended Reading: Battle of the Alamo; Remember the Alamo!